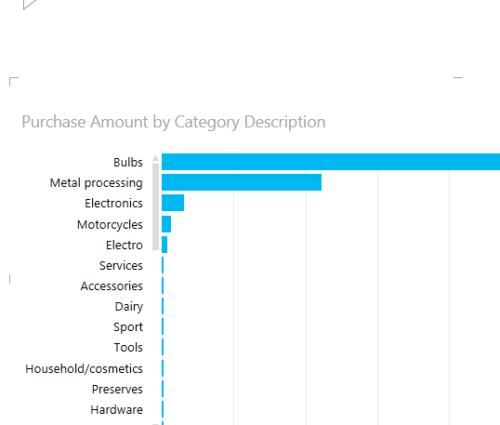 Welcome to a 3 part series on Power BI; Microsoft’s self-service analytics offering. In part 1 the tenets of self-service analytics are discussed along with an introduction to Power BI. Part 2 discusses Power BI capabilities in detail, and Part 3 discusses Power BI deployment scenarios. Thick or thin clients – Desktop full client installation versus delivery via web browser. This affects the ability of the organization to respond to information consumer requests. Is it necessary to wait for a tool to be installed on the desktop or can it be accessed in a more timely manner using a zero footprint client. On or off premises – On premises versus hosted versus a pure cloud subscription model. This affects the cost of and time to deployment. Also, what is the cost differential internal versus external hardware/software resource management and subscription fees. Existing user experience – Level of comfort with the analytic tools. This affects the information consumer’s ability to fulfill their self-service requirements. Do they need to adjust to an extreme paradigm shift in how they interact with deployed analytic tools or can they leverage existing skills. Complexity – What types of analytic capabilities are required. Are the analytic requirements descriptive (what has happened) or predictive (what could happen). Addressing all of these issues may seem insurmountable, but they can be addressed as long as there is a clear understanding of the self-service analytic requirements. 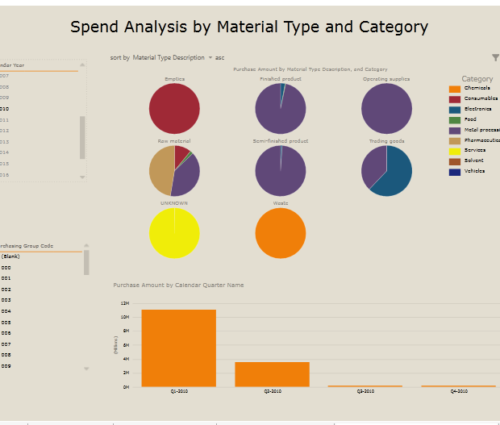 Now let’s examine how one solution (Power BI) addresses the challenge of self-service analytics. 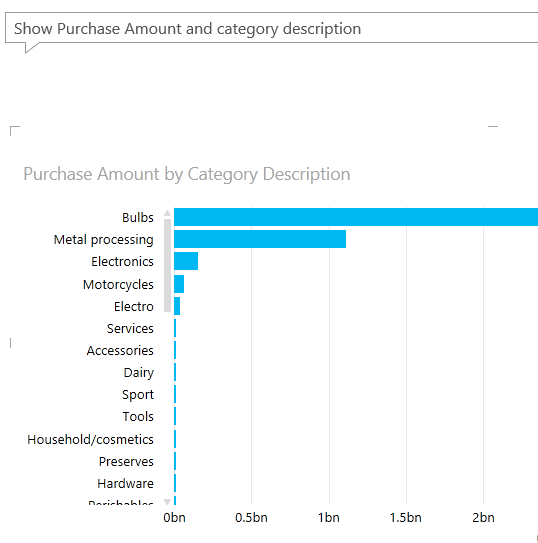 Power BI is Microsoft’s offering in the self-service analytics space. Power BI consists of several technologies that complement each other and can be combined to meet a variety of self-service analytic use cases. 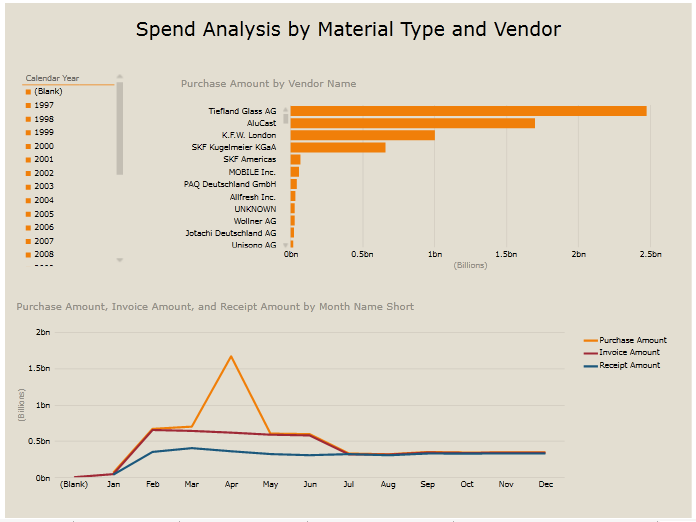 Power View – Can be classified as data visualization tool. It is available via an Excel plugin (Included with Office 2013 Professional Plus). 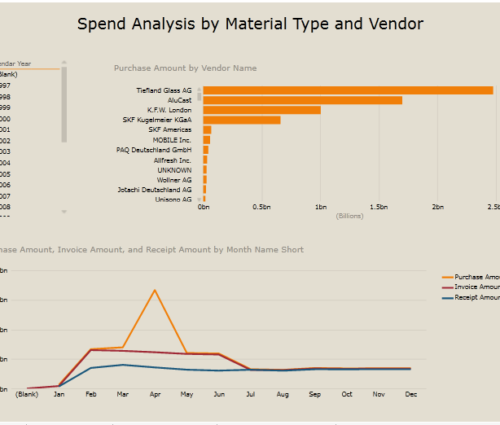 Using Power View, information consumers can place multiple visualization objects (charts, grids, maps) on a page along with filters and slicers. How the objects interact is a function of the underlying relationships defined in the data source’s semantic model. The model itself may be constructed by IT or a power user and deployed for others to consume. In most cases this means that the information consumer can focus more on analysis and less on the complexity of data modeling. This also means that it is now possible to get more subtle views of data relationships. Following are 2 examples of Power View visualizations. Note that selecting one of the bars in the bar chart or slices in the pie chart will interact with all of the other objects on the page. 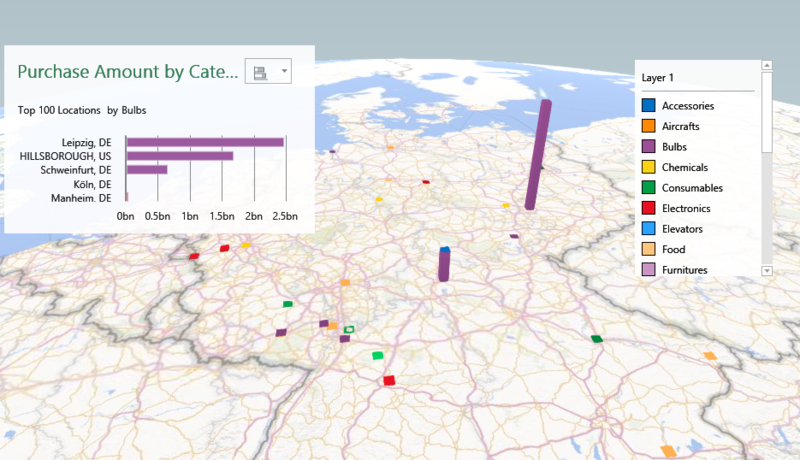 Power Maps – Like Power View, Power Maps provides data visualization capabilities but with a focus on geo-spatial data. It is available as an Excel plugin (Currently in preview). 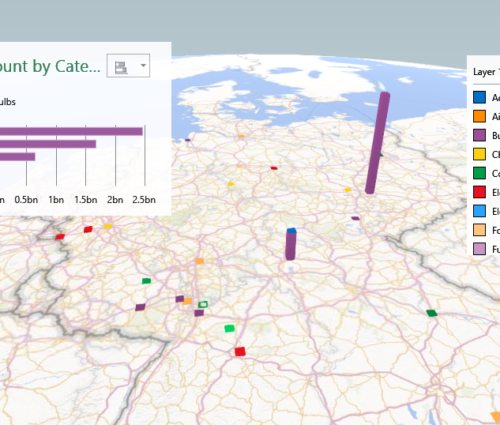 Power Maps visualizes data in the form of a two or three dimensional map. It can use ISO country/region codes, city names, country names, zip codes and longitude/latitude to map single or multiple values. The values can be displayed as grouped or stacked columns/bars. Power Maps supports multiple map layers and provides for on screen annotations. Power Maps also relies on the data source’s semantic model to determine how data should be grouped and summarized for display. Following is an example of a Power Map visualization. Power Pivot – Provides the capability to combine and aggregate data from multiple data sources and is available as an Excel plugin (Included with Office 2013 Professional Plus). Data to be used in Power Pivot is imported and stored internally within an Excel workbook. Relationships and calculations can then be defined for the imported data. Power View and Power Maps can leverage the imported Power Pivot data along with the defined relationships and calculations. Power Pivot relies on in memory technology and data compression. This means that it is possible to perform an analysis on millions of rows within an Excel Power Pivot workbook. All of these sources can be combined within a model inside an Excel workbook. Furthermore, minimal data transformations can be made to the data at load time such as substring extraction and re-coding. The defined data transformations can be saved for future use when the data is reloaded. All of the aforementioned capabilities are available in the desktop version of Excel (Office 2013 Professional Plus). In the cloud, using Office 365, it is possible to consume all of the BI artifacts created with the desktop applications thus allowing for flexible deployment scenarios among content creators and content consumers. Office 365 offers an additional Q&A capability that is not available in the desktop offerings. Using Q&A, it is possible to generate visual responses to plain text queries. Following is a sample query with the generated response. 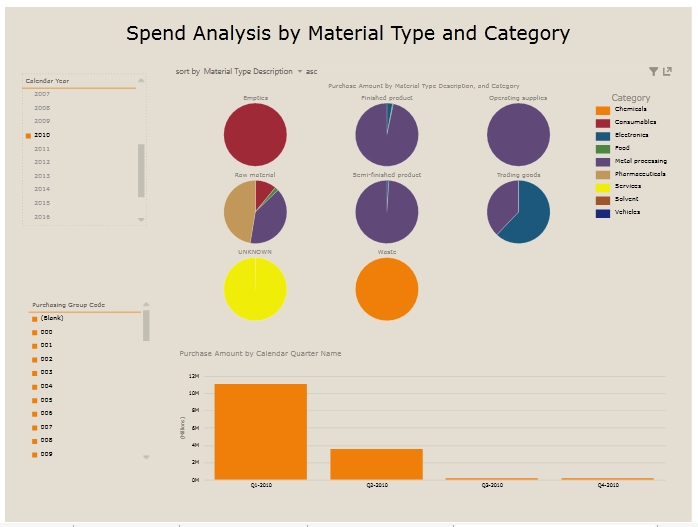 There is also a Windows application available in the Windows application (preview) store that allows the consumption of Power BI content in the form of Excel workbooks and Power View reports. 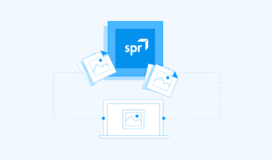 SharePoint – Provides a mechanism for the deployment and consumption of self-service analytic content. It is also possible and practical to build communities around this content thereby providing a mechanism for enhanced enterprise-wide collaboration and decision making.